Last time in this series on resonance, we saw that resonance forms represent two (or more) different ways to draw the same molecule, which differ only in their distribution of electrons. What’s different in the molecules below? 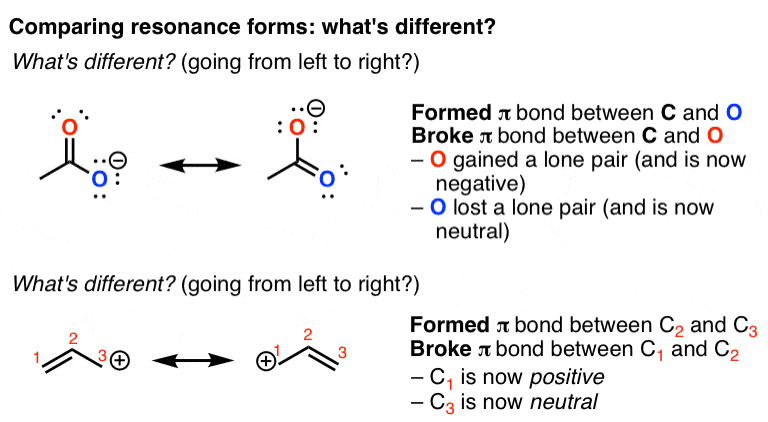 Specifically, what bonds formed and broke? Where did the electrons actually go? In both cases the resonance form on the right contains all the same atoms of the molecule on the right, but the electrons have been moved around (or to be more specific, electron pairs). There are two places we will find electron pairs: they will either be found in bonds or as lone pairs on atoms. That’s it. For the purposes of discussing resonance, we’ll confine our discussion of “bonds” to π bonds exclusively. 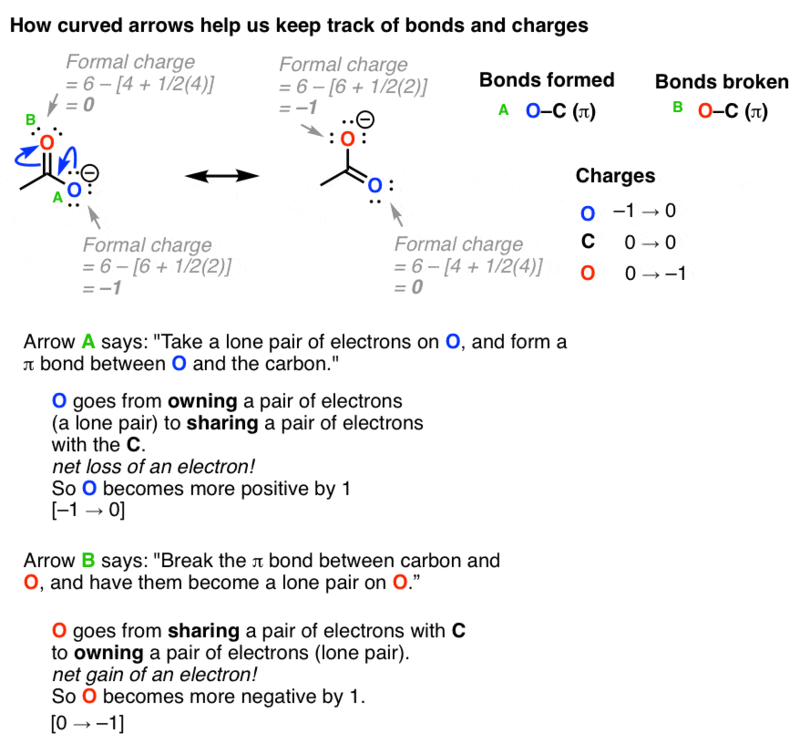 Here’s the punch line: we can convert one resonance form into another by showing the movement of electrons between bonds and lone pairs (or vice versa). We just need a graphical tool to do it. Thankfully, Robert Robinson devised such a tool for us to use. It’s called the “curved arrow”. 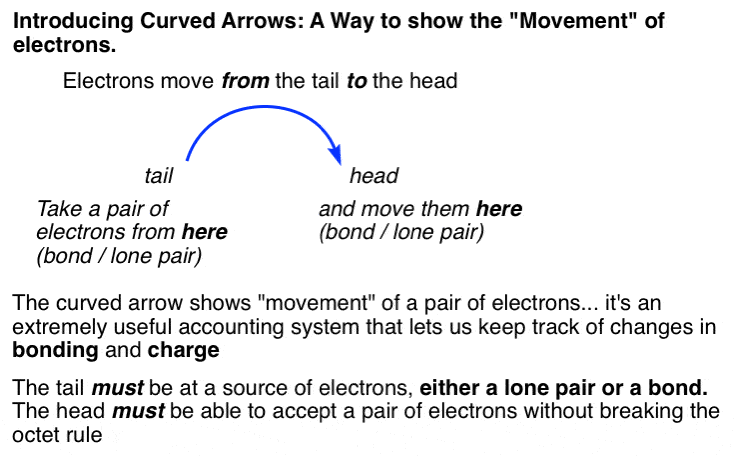 The curved arrow shows “movement” of a pair of electrons. It’s an extremely useful accounting system that lets us keep track of changes in bonding and also in charge. Since electron pairs are present either in bonds or in lone pairs, there are really only four combinations of “moves”. Only three of them are actually legal. Every resonance form for a molecule can be found through the application of these three moves. If you look closely, with each arrow we are changing the formal charge by 1. The charges change at the tail, which becomes more positive (since it’s giving away electrons), and the head, which becomes more negative (since it’s gaining electrons). Note that last example, lone pair to lone pair, is not legal. It’s illegal because we are changing the formal charge at each carbon by 2 units (from –1 to +1 and from +1 to –1). This is not allowed for a single arrow. Here’s some common “dumb” questions about curved arrows. Are we ever allowed to give an atom more than 8 electrons? NOOOOOO (at least not with C, N, O, F). This brings up an excellent point. When it comes to drawing, chemists are ingenious at finding ways to be lazy. 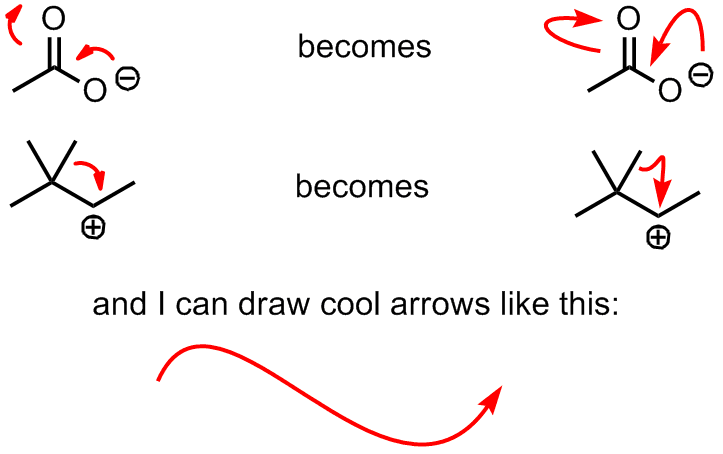 We can also draw the tail of curved arrows as coming from negative charges (as long as there are electrons on that atom, remember how formal charge can be misleading). 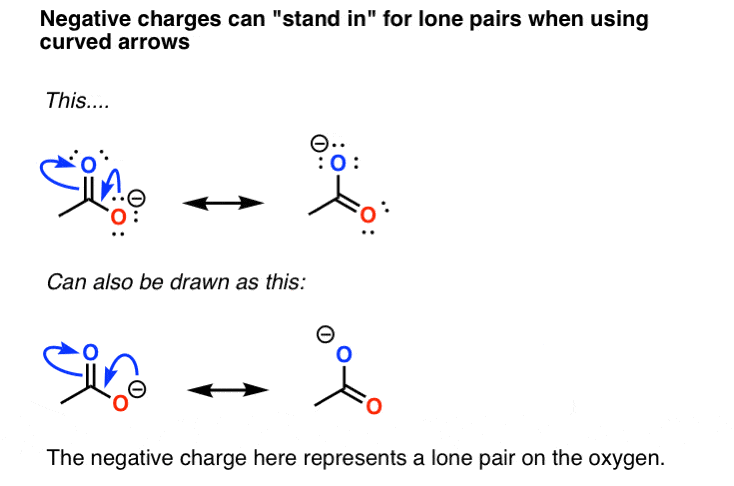 This makes our lives a little easier because who really wants to draw lone pairs if they don’t have to? From now on in this series I’m only going to draw in the lone pairs if absolutely necessary. Otherwise I’ll just draw the curved arrow as coming from the negative charge. Just be careful, however – if the atom is neutral, you MUST draw in a lone pair of electrons. Never draw the tail of a curved arrow from an atom with no lone pairs. This covers the basics of the curved arrow formalism. Now that we can start to use curved arrows to draw resonance structures, we can also think about how to evaluate the relative importance of some simple resonance structures. That’s the subject of the next post. Just to show another application I’ve drawn in a second, detailed breakdown of arrow pushing in the carboxylate ion we discussed last time. Yes, it’s ridiculous in detail but sometimes that helps. #FirstWorldChemDrawProblems I find if I use the built in 90o or 120o arrows in ChemDraw, my arrow heads sometimes look like single-barbed arrows like in the last drawing on this page. and electrons move away from the tail, so the tail becomes more positive. Interestingly, you never mention the commonly spouted but incorrect idea that conversion of resonance structures always involves the movement of pi electrons and/or the formation of pi bonds. Poppycock! Poppycock? Give me an example of resonance that is not about pi electrons or pi bonds then ? That drawing has an error, it should have a pi bond in it. And it seems like either an example of an E2 or of hyperconjugation…. Gak; My fault. Let’s try that again, with a more useful example. Don’t mean to start a flame war. Hyperconjugation (or “double-bond no-bond resonance”) is the idea; the point is that hyperconjugation is really just a fancy form of resonance. When the applications are structural (conformation, bond lengths/angles, etc.) it can be called resonance because the electron flow doesn’t really reflect chemical change—it helps us explain structural reality. I agree that hyperconjugation is a “possible” example of resonance ( a special case). However, I don’t like the example you cite because it is really an E2 reaction. I see the area you are dealing with (the gauche effect) and why you might like to call it resonance. Anyway, I’d make the case that it does involve pi systems because the one form contains a new pi bond. But why not just call it hyperconjugation which can it’s own unique characteristics that can be used to keep it distinct ? I think that can only help students of organic chemistry in the long run. The FCH2CH2F certainly is an interesting example. I just looked at a few references to check C-F bonds lengths…. for 1,2-difluoroethane Xray data gave 1.39A. A general list of typical sp3C-F data cited 1.4A. At a first assessment this rationale for the geometric preference might be flawed because it doesn’t seem to rationalise the C-F bond length trend correctly. This is fantastic. Clears up a lot of dumb mistakes I could have avoided in Orgo 1. This semester will be better! Thanks so much James!